Yes, it's the return of the occasional Friday segment in which I run down the cool things this week that aren't quite big enough to be their own posts. This week, I'm talking about the sci fi shows Black Mirror and Orphan Black, plus a dirty-minded Doctor Who card game. I've already blown my New Year's resolution by yelling at my sister for not watching Orphan Black when BBCA re-aired the pilot episode last week. Oh well. There's always 2015. If she doesn't start watching, I may need to resort to this. I feel justified, though. We've got to get ready for the April 19 premiere of season 2. To whet your appetite, here's a peek at the first scene in season 2, which was unveiled at the Television Critics Association press tour this week. In other news, who else thinks Tatiana Maslany was robbed of a best actress statuette at last week's Golden Globes? How many characters does a lady have to tackle, amirite? Ever play Apples to Apples? Or its beer-drinking, motorcycle-riding no-good cousin, Cards Against Humanity? 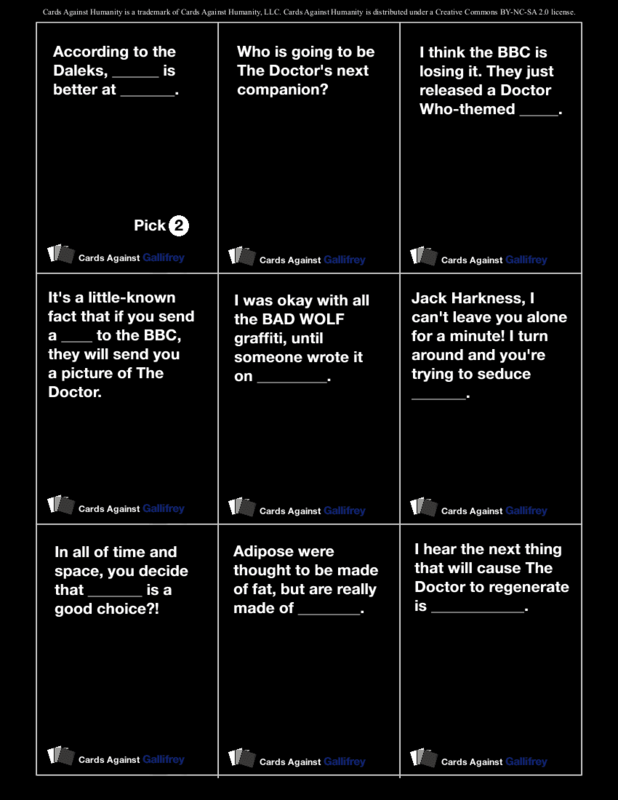 If so, you can understand my delight in discovering Cards Against Gallifrey. For those who don't know, you pick the best white card response to the prompts on the black cards, and the designated chooser selects the best response. 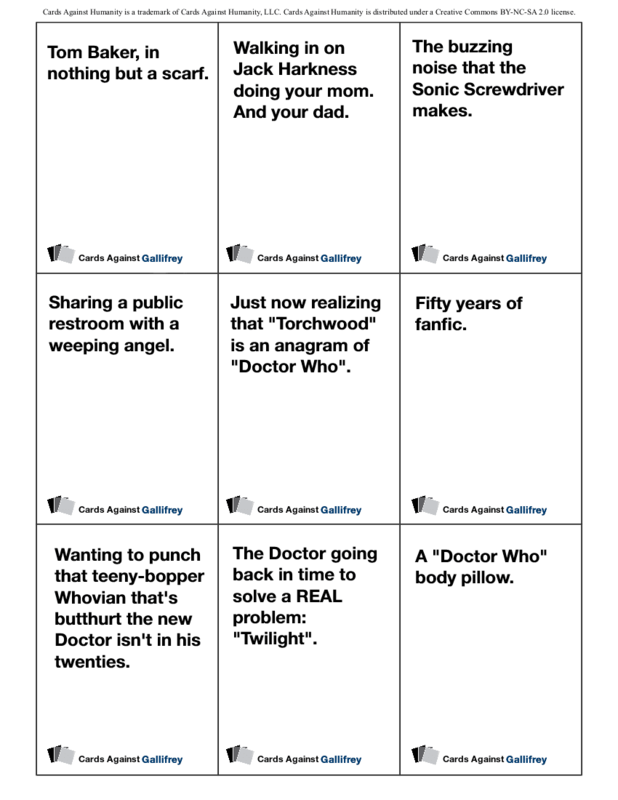 You can download this Cards Against Gallifrey set for free and get them printed at your nearest Staples-esque store. It'll be a bit hit at your next gathering of Who-fan friends. If you want more themed card games, consider Ladies Against Humanity, too. 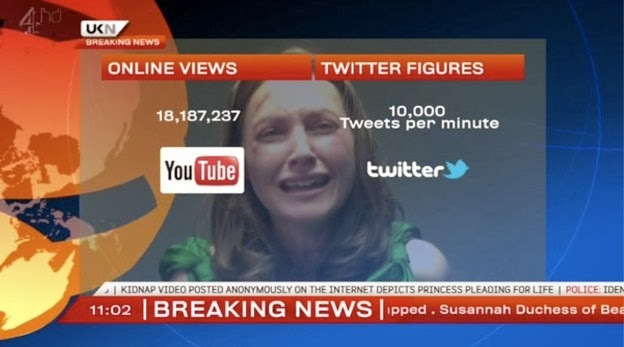 Chances are good that you haven't seen the British series Black Mirror, but you've got a good excuse. It's only aired in the U.K., it's not available on DVD or streaming in the States, and it's only recently started airing on DirectTV. But if you have the means to, er, acquire it using, say, a computer and a connection to the Internet ... well, I'm not saying you should. I'm just saying it's some excellent television. It's got a Twilight Zone-setup, inasmuch as each hourlong segment tells a different story with sci fi overtones. One of the biggest themes of Season 1 is the creeping prevalence of technology and social media in our lives. (I'm being a little vague here; I think the pleasures of the show are best discovered on your own.) The acting and directing are slick, and you'll want to watch it with a buddy so you have someone to discuss each episode with afterward. It'll also make you want to shut off your cell phone and stop multitasking on Twitter quite so much. From "The National Anthem," season 1 episode 1. So. I've introduced Black Mirror to you. It's been on my mind since my friend Sarah posted an article about meMINI, a wearable camera that records your life in five-second to five-minute increments and that you can save to the cloud or share on social media. Cool, right? Well, yes. In theory. Unless you've seen the third episode of Black Mirror, "The Entire History of You," in which people are implanted with a chip that lets them record moments of their lives to replay and enjoy in perpetuity. What could possibly go wrong? Lots. Lots of things can go wrong. Here's the teaser for the episode; you can get a glimpse of the downside for yourself. I love it when entertainment and real-world tech developments start to merge, don't you? Yeah, she lasted all of 12 days before admitting resolution defeat. I think your resolution for 2015 should be to last one month without emphatic media suggestions.